Trinidad and Tobago’s annual Carnival, one of the Caribbean region’s biggest cultural events, is once again front and centre in the latest issue of Caribbean Beat. 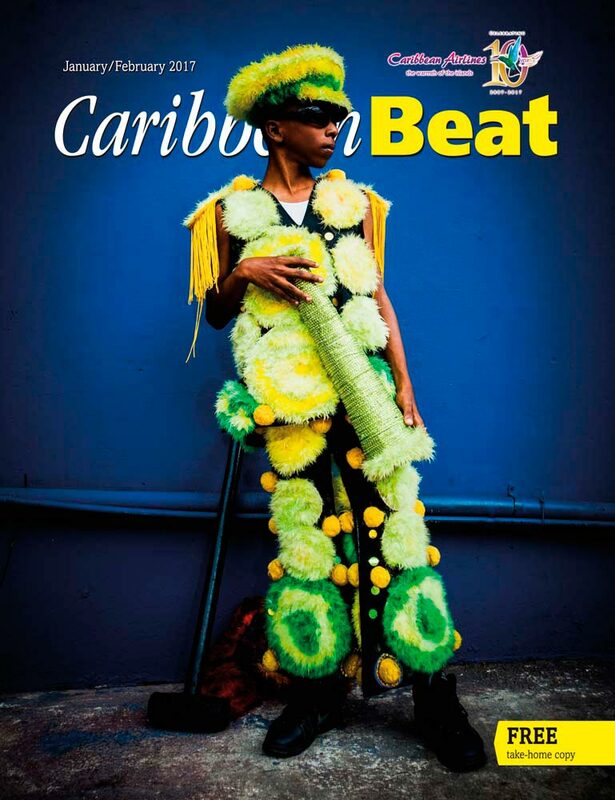 With a striking photo of a young fancy sailor masquerader on the cover, the January/February issue of the magazine includes a feature called “Carnival is mine,” offering stories about the Carnival experience from the perspectives of a musician, a masmaker, and a photographer, alongside first-person accounts of the Panorama steelpan competition and J’Ouvert morning. In other Carnival-related coverage, the magazine also offers a photographic tour of “Carnival planet,” visiting Carnival celebrations on five continents, from Rio in Brazil to Goa in India, from Cape Town in South Africa to Venice in Italy, and even further afield. January 2017 also brings the tenth anniversary of Caribbean Airlines, a milestone commemorated with a special section of the magazine. Here readers will learn about special anniversary plans, meet star employees who help make CAL “the Caribbean’s Leading Airline,” and learn about some key moments in the history of Caribbean aviation. Elsewhere in this issue, Caribbean Beat profiles the UK-based Trinidadian writer Vahni Capildeo, who was recently announced as the winner of the 2016 Forward Prize, one of the most prestigious international awards for poetry. The magazine also tells the story of a fascinating but little-known historical figure, Fanny Eaton — a mixed race Jamaican woman who, a century and a half ago, took the Victorian art world by storm, serving as a model for a generation of groundbreaking British artists. Today her likeness is preserved in works by leading Pre-Raphaelite painters, but little is remembered about her life story. This issue’s travel section opens with “Tobago therapy,” offering suggestions for a spirit-soothing getaway in Trinidad’s sister island. The regular “Neighbourhood” column visits Roseau, charming capital of Dominica, the Caribbean “Nature Isle.” And the “Layover” column offers tips for making the most of a quick stop in Antigua — from shopping to excursions to a beach trip you can make from the airport terminal. Other highlights of the new Caribbean Beat include a preview of the 2017 blind cricket World Cup in India, where a West Indies team will compete against sight-impaired cricketers from around the world; a visit to Jamaica’s new Peter Tosh Museum, celebrating the life of the late reggae musician; and a look at the growing popularity of electric cars in the Caribbean, a region with almost ideal conditions for the environment-friendly vehicles. The latest issue of Caribbean Beat is now on Caribbean Airlines planes (your take-home copy is free! ); in the hands of our subscribers the world over; and on our website. You can also buy a digital edition or a digital subscription to read and save issues of Beat on your smartphone, tablet, computer, and favourite digital devices! And of course, if you haven’t already, make sure you’re connected to us on Facebook and Twitter to get all the latest Caribbean buzz. Nicholas is the editor of Caribbean Beat and editor of The Caribbean Review of Books (CRB). He is also one of the administrators of the contemporary arts space Alice Yard and the Bocas Lit Fest (The Trinidad & Tobago Literary Festival). His reviews, essays, and poems have been published in various periodicals.